INCOME-TAX DEDUCTION(TDS) FROM SALARIES DURING THE FINANCIAL YEAR 2017-18 UNDER SECTION 192 OF THE INCOME-TAX ACT, 1961. 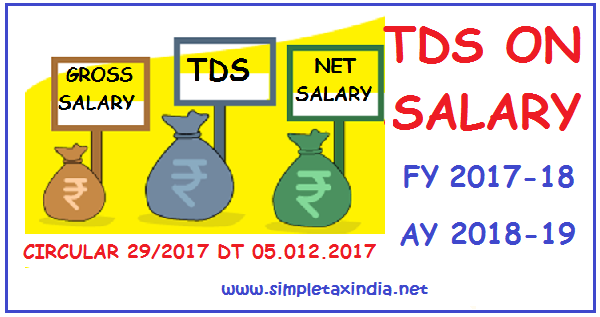 CBDT has issued a Circular No 29/2017 dated 05.12.2017 under which guidelines and instructions has been explained regarding How to calculate TDS on Salary in Financial year 2017-18 Ay 2018-19. Download Link is given at the end. Where the total income does not exceed Rs. 2,50,000/-. The amount of income -tax including the surcharge if any, shall be increased by Education Cess on Income Tax at the rate of two percent of the income-tax. Every person who is responsible for paying any income chargeable under the head "Salaries" shall deduct income-tax on the estimated income of the assessee under the head "Salaries" for the financial year 2017-18. The income-tax is required to be calculated on the basis of the rates given above, subject to the provisions related to requirement to furnish PAN as per sec 206AA of the Act, and shall be deducted at the time of each payment. No tax, however, will be required to be deducted at source in any case unless the estimated salary income including the value of perquisites, for the financial year exceeds Rs. 2,50,000/- or Rs.3,00,000/- or Rs. 5,00,000/-, as the case may be, depending upon the age of the employee. (Some typical illustrations of computation of tax are given at Annexure-I). The income chargeable under the head “salaries” of an employee below sixty years of age for the year inclusive of all perquisites is Rs. 4,50,000/-, out of which, Rs. 50,000/- is on account of non-monetary perquisites and the employer opts to pay the tax on such perquisites as per the provisions discussed in para 3.2 above. Section 192(2) deals with situations where an individual is working under more than one employer or has changed from one employer to another. It provides for deduction of tax at source by such employer (as the tax payer may choose) from the aggregate salary of the employee, who is or has been in receipt of salary from more than one employer. The employee is now required to furnish to the present/chosen employer details of the income under the head "Salaries" due or received from the former/other employer and also tax deducted at source therefrom, in writing and duly verified by him and by the former/other employer. The present/chosen employer will be required to deduct tax at source on the aggregate amount of salary (including salary received from the former or other employer). 3.4.1 Under section 192(2A) where the assessee, being a Government servant or an employee in a company, co -operative society, local authority, university, institution, association or body is entitled to the relief under Section 89(1) he may furnish to the person responsible for making the payment referred to in Para (3.1), such particulars in Form No. 10E duly verified by him, and thereupon the person responsible, as aforesaid, shall compute the relief on the basis of such particulars and take the same into account in making the deduction under Para(3.1) above.